STAMFORD — Corporations, developers in the South End, along with East Side businesses and residents, all want to clear hurdles and make a long-sought East Main Street train station a reality, said James Grunberger, chairman of the nonprofit East Side Partnership. New commuters at NBC Sports at Chelsea Piers, as well as long-standing residents and business owners, want to access Metro-North Railroad‘s New Haven Line without going to Stamford’s downtown station, he said. 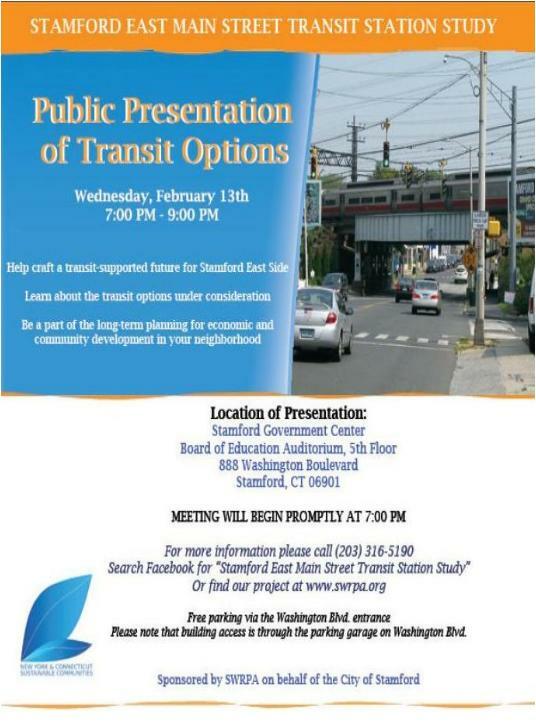 Residents will get the chance next week to hear about possible options for the East Main Street rail station, expanded bus service, and other information from a study on improving transit links to the East Side. 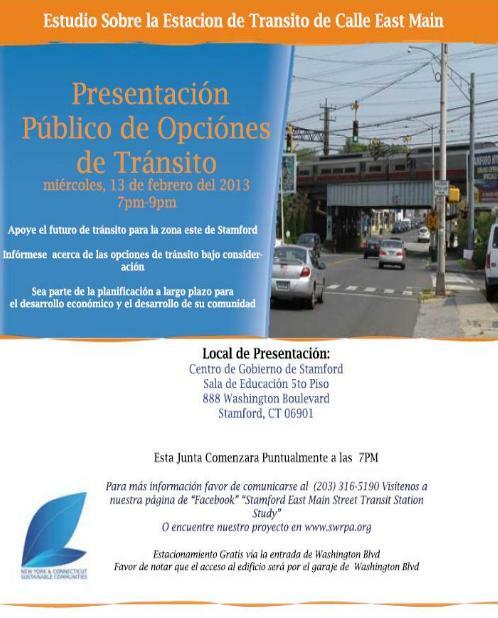 A South Western Regional Planning Agency public presentation on the city’s ongoing $180,000 East Main Street Transit Station Study will be held at 7 p.m., Wednesday in the fifth-floor auditorium of the Stamford Government Center, 888 Washington Blvd. Craig Lader, SWRPA’s senior transportation planner, said the study begun in 2012 is evaluating the feasibility of three general areas for train station that could be linked to the New Haven Line or the New Canaan branch between Stamford and Glenbrook. A concept for a rail station on Culloden Road, in a residential neighborhood, might have less area economic influence but could accommodate a station on either the main or branch line without reconfiguring tracks, he said. A branch line station on East Main Street at the railroad trestle would put a rail connection in the center of the neighborhood and, presumably, result in a larger economic benefit, while a New Haven Line station there would face resistance from the Federal Railroad Administration because it would require a disruptive track realignment, Lader said. Choosing that location would also almost certainly include the extra expense and process of acquiring residential and commercial properties, he said. A third location, south of East Main Street under the Interstate 95 overpass, would not require any property acquisition or realigning tracks, but would require relocating overpass support pillars and crash walls to accommodate a main line station, he said. The study will also consider how to add bus service to improve area mobility while building a train station. Steven Wise, a partner in development of the 300,000 square-foot Chelsea Piers, said the rail station would make the East Side more appealing for residential development and also benefit existing businesses. Wise, who also developed Glenview House, a 146-unit luxury apartment development at Glenbrook Road and East Main Street, said real estate firms would also be more likely to create similar projects with a new station’s improved transit access. Jonathan Hoch, chief community officer for the nonprofit Domus organization, said area families see a train station as an important economic spur and critical amenity for an up-and-coming area.